There has been considerable discussion as to whether “small cell” foundation (4.9mm diameter vs. the industry “standard” of approximately 5.4mm) has potential as a means of controlling varroa reproduction. Research on Africanized bees in South America indicates that small cell size may reduce mite reproduction, yet data from South Africa and Europe have been equivocal, or demonstrated just the opposite. Unfortunately, most reports of its success have been anecdotal. Despite the great interest in this subject, there have been surprisingly few controlled field trials published. 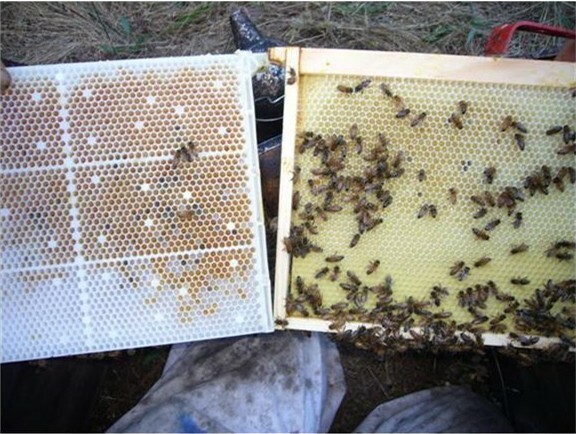 The purpose of this experiment was twofold: (1) to see if fully-formed small cell combs suppressed varroa mite population buildup in a field trial over the course of a season, and (2) to determine whether package colonies developed differently on HoneySuperCell (HSC) plastic frames as compared to controls. HSC frames were used for several reasons: (1) since they are manufactured with fully-formed full-depth cells, and thus there is no variability of cell size due to the work of the bees, (2) the inner cell diameter is approximately 4.9mm at the base, and thus meets the stipulations of small cell proponents (Dee Lusby, pers. comm. 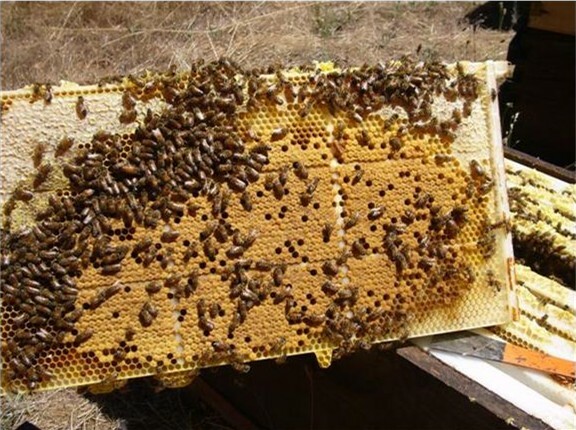 ), (3) the combs are advertised not to require “retrogression”–the two-stage stepping down process required to force bees to accept small cell size, and (4) the combs come fully assembled, and do not require wiring in wax foundation. As controls I used new Dadant preassembled frames with beeswax coated Plasticell® foundation. On May 22, 2007, we started ten colonies on each type of new combs in identical 9-5/8” depth equipment. Colonies were set up the in the same yard at the beginning of blackberry flow, in Grass Valley, CA, at approximately 2600 ft elevation. There were few managed or feral colonies in the area, so it was likely that mite influx pressure from other colonies was low. We flipped a coin to determine the type of frames used in each hive, and started the colonies as singles over screened bottoms. Colonies were arranged to minimize drifting. 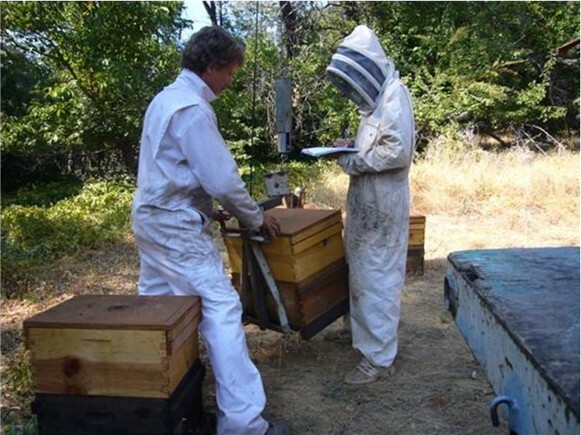 Each colony was stocked with approximately 6 lbs of shook bees from a commercial operation. The donor colonies had recently been treated with Tactik®, thus, initial mite infestation was very low. The bees were mixed well in bulk transport cages. I obtained sister concurrently-mated Italian queens (not selected for mite resistance) from a California breeder. Twice during the first nine days we swapped positions of the few weak or strong colonies (within groups) to equalize populations. All colonies were fed ½ gallon of 50:50 sucrose syrup weekly, and commercial 1-lb pollen patties equally. We gave each colony a second brood chamber of matching frames on July 13. There was a light nectar/pollen flow for the rest of the season, augmented by weekly feeding to allow continued buildup and comb building, and to stimulate brood production, and thus, mite reproduction. No mite treatments were used during the trial, other than the colonies having screened bottom boards. Recording weights of colonies using truck-mounted hive loader and spring scale. The author on left. 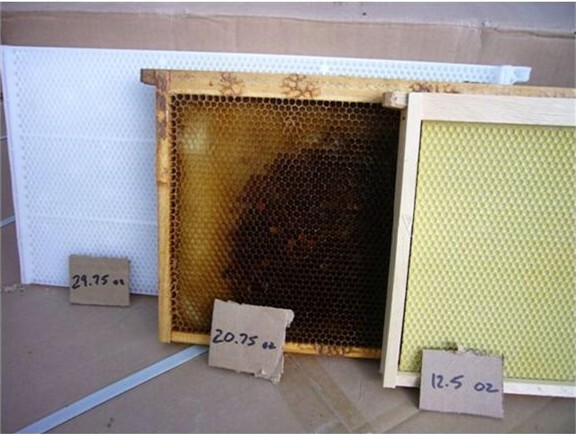 On September 30, since some colonies were on the verge of becoming honeybound, we roughly equalized colony weights by swapping frames of honey (free of bees or mites) between colonies within groups. On October 14, we took final mite counts, added the last pollen substitute patty, and determined frame strength counts. We gave a final feeding of 1 gallon of Fumagilin-B® syrup on November 15. The crew noted that the HSC combs were quicker to install in the boxes. However, HSC frames weighed approximately 1 lb more each than the controls (Fig. 2). However, HSC combs weighed only 9 ounces more than fully drawn control combs. Thus, a double-deep colony with HSC combs could be expected to weigh an additional 11 pounds. Weights of combs. Left to right: HoneySuperCell, drawn comb of Dadant Plasticell, new frame of Plasticell foundation. The expected additional weight due to the HSC frame would be about 5 ½ lbs per 10-frame deep box. Bees readily accepted both types of frames, and clustering and colony appearance was similar. There was perhaps a slight tendency for the queens in HSC colonies to move more slowly into the second brood chamber. The colonies built far more burr comb between the plastic HSC top and bottom bars, and to the lids, than they did with the wooden controls. This resulted in some difficulty in colony inspection, and especially in lid removal (Fig. 3). Example of burr comb built attaching top bars of HSC frames to lid. Similar comb is built vertically between frame top and bottom bars. Such comb made it more difficult to pry off the hive cover. Queens initiated egglaying similarly, but larval development was spotty for the first two brood cycles in HSC colonies. After that, brood appeared similar between groups (Fig. 4). Typical HSC brood comb after second brood cycle. Pattern was spotty for the first cycle or two. The HSC colonies gained weight more slowly than the controls (Fig. 5), and by September 9 averaged approximately 25 lbs lighter–46 lbs gain vs. 71 lb for controls. However, there was less weight variation (especially in the upper box) with HSC frame hives (s.d. = 9.98 lbs vs. 17.8 lbs for control). Some control colonies plugged the bottom box before moving into the upper box. In the HSC colonies, bees worked nectar/honey into the upper box more uniformly. Typical initial nectar and pollen storage on combs to sides of cluster. The bees appeared to readily accept the HSC combs (left) for storage. Surprisingly, overall weight gain was greater for the control combs built on foundation (right). On October 14, there was no significant difference in frame strength of colonies, but there was less variation in strength in the HSC colonies. Average frame strength was about 10 frames, and most colonies had put on adequate stores of honey for winter. The most striking result of this trial was the difference in natural mite drops (Fig.6). HSC colonies consistently had lower mite drops, especially toward the end of the season. Of note is the great spike in mite drop for all but one colony on October 14. Graph of natural mite drop vs. time. Red plots are for the 10 control colonies, blue for the HSC combs. 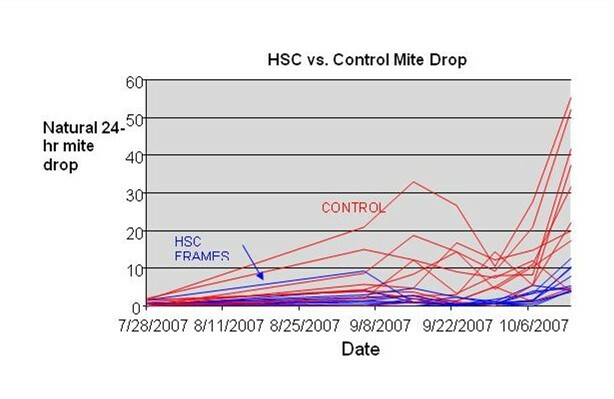 Note the distinct trend toward lower mite drops from the HSC colonies. Unfortunately, all but one of the control colonies perished at the onset of cold weather, and most of the HSC colonies followed suit in February. It appeared that they suffered from the sort of CCD-like collapse that occurred at that time in my operation, especially in colonies untreated for mites. A surprising result was the greater amount of honey stored in the control group. One would expect the bees to be able to store more honey in the preformed cells, since no wax would need to be produced to form the cell walls. I have no explanation for the contrary results observed. The most notable result was the great difference in natural mite falls between the groups, which implies a lower mite buildup in the HSC colonies. At face value, this result would appear to support the hypothesis that small cell combs hamper mite reproduction, and indeed, they well may. However, I would caution the reader not to extrapolate these results. This was a trial of HoneySuperCell combs—not small cell per se. There are various hypotheses as to why the HSC combs may have suppressed mite buildup—one of which is that they have small cell size. However, it could well be that mite buildup was suppressed by some other factor or factors. Since the cells are rigid, none could be reworked by the bees into drone cells, which alone could greatly suppress mite buildup due to the greater reproductive success of mites in drone brood. This hypothesis would be predicated on the assumption that bees would build more drone comb in the control colonies. However, due to the late start of this trial, there did not appear to be much drone comb production in any colonies. The smaller cell size, thickened walls, or tapered shape of these combs might affect mite invasion of the cell, foundress mite relocation during the process of cocoon spinning, postcapping duration, or mite feeding, reproduction, or mating in a more restricted space. Sicne HSC combs are fabricated from plastic, the plastic itself might have some effect upon the mite. This hypothesis is supported by the observation that the first rounds of bee brood were negatively affected by HSC—it appeared that the queens laid eggs in the cells, but that they did not develop to maturity. There could well be other unrecognized effects of small cell size or the HSC frames upon the mites. Most published trials of small cell have involved measurement of mite reproduction in only hundreds of cells. Unfortunately, the results of various studies have been equivocal. In general support of small cell, Yapalucci and de Jong (2001) found that varroa reproduced best in old small cells, followed by new small cells, then more successfully as cell size increased (but only 1.5 times greater from smallest to largest cell size). Message and Goncalves (1995) found varroa reproduction to be double in large cell vs. small cell. On the other hand, Davidsson (1992) stated that her “results do not indicate that the reproduction of mites was substantially influenced by cell size on worker bee brood.” Taylor (2005) reached a similar conclusion. Surprisingly, in a recent field trial, Jennifer Berry at the University of Georgia (in prep) found greater varroa reproduction in small cell. However, she used beeswax small cell foundation, as opposed to the plastic full-depth combs in this experiment. On an even larger scale, Johannsmeir (2001) notes that when varroa reached South Africa in 1997, all managed and feral colonies already contained small cell combs, since that is the size that African bees build. Yet he observed that “varroa mites are quite capable of reproducing and increasing on worker brood of African honeybees.” Indeed, Allsopp (2006) notes that initial varroa levels in South African colonies reached levels of up to 50,000 mites! Small cell alone clearly did not control varroa initially in that country. So what do we make of the anecdotal reports by beekeepers claiming success with small cell? I count some of them as friends, and greatly respect their observations. Dee Lusby is clearly the guru of small cell (and produces a mesquite honey that is to die for!). Dee has written extensively on the subject (www.beesource.com/pov/lusby/). I also suggest investigating the cell size variation in naturally-drawn combs (read Dennis Murrel’s meticulous observations at www.bwrangler.com/bee/index.html). Michael Bush has information at www.bushfarms.com/beesnaturalcell.htm. “Prof Baudoux was so successful with his writing and his experiments, and so convincing, that manufacturing houses all started selling foundation with enlarged cells and claiming good results for the use of the same. So, have we come full circle a hundred years later, with Dee now being the one making convincing claims, but going in the opposite direction? 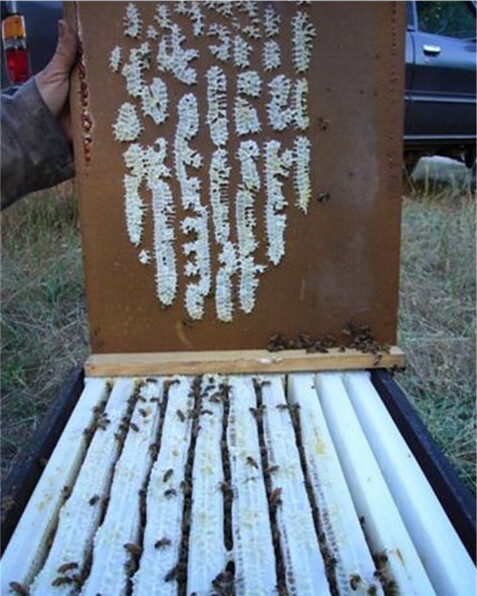 Clearly, there are beekeepers successfully keeping bees on small cell without other mite control. So how do we explain their success? I have no desire whatsoever to enter into the small cell debate. The sheer number of small cell beekeepers claiming success with the method, plus the fact that natural combs typically contain smaller cells in the middle of the brood nest, lead me to keep an open mind on the subject. I am eager to see the results of further controlled trials, of both HoneySuperCell and small cell (or variable cell) in general. It would be of considerable interest to see if a few HSC combs placed in the center of the broodnest would have an effect upon mite levels (see Dennis Murrel’s suggestions). I had planned to continue with this trial through the next season, but the untimely collapse of the colonies unfortunately prevented further data collection. There are other trials currently in the works, both by researchers, and by commercial beekeepers. I will post updates to scientificbeekeeping.com. Disclosure: this experiment was unfunded. Mark Hamby (manufacturer of HoneySuperCell) donated the HSC frames, and at my request paid for the bulk bees. All other equipment, queens, feed, and labor were out of my pocket. I received no other funding from the company, have no financial association with the company, and have no vested interest in the outcome of the experiment. As a follow up to my HoneySuperCell trial, I restocked the hives, and have run them mixed arbitrarily in my operation of 500 colonies. In general, but not absolutely, we have avoided giving the HSC colonies mite treatments, just to see what they’d do. Danged if they don’t just keep plugging along–often outperforming the “normal” colonies alongside (note that we often find the HSC colonies to be more defensive, although we did not restock them with any special queenlines. We notice this increased defensiveness upon most inspections, but have never quantified it). I have also not sampled the HSC colonies for mite levels in general. Those few that I have did tend to have low levels, but I would not consider that to have any statistical significance. I have spoken to others who have used HoneySuperCell, and they also report that mite levels remain low. I personally find the HSC combs difficult to work and to be heavy. I also have issues with the amount of plastic used. As I’ve previously stated, I do not know if the apparent effect of HSC on mite levels is due to the cell size, or due to something else. The effect could just as well be due to outgassing, cell humidity, or something else. Davidsson, M (1992) The influence of cell size in Varroa reproduction. Examination paper, Swedish University of Agricultural Sciences. Johannsmeier, MF, ed. (2001) Beekeeping in South Africa. Agricultural Research Council (South Africa). Message, D and L.S. Gonçalves (1995) Effect of the size of worker brood cells of Africanized honey bees on infestation and reproduction of the ectoparasitic mite Varroa jacobsoni Oud. Apidologie 26(5): 381-386. Yapalucci, G & De Jong, D (2001) Effect of the brood comb cell size on the morphologic variability of the africanized honey bees (Apis mellifera) and on the infestation and reproduction of the Varroa jacobsoni mite. Masters Thesis, Universidade de São Paulo.